The Mi Notebook Pro is a great laptop – an astounding piece of tech, in fact. It uses cutting-edge components and can be had for far less than rival machines. Some fundamental issues remain, though. Xiaomi has fingers in a lot of pies. The Chinese company is better known for its smartphones but also manufactures a host of other products, from electric rice cookers to air purifiers. Its laptops, however, have been the real head-turners over the past 18 months. Following the Xiaomi Mi Notebook Air 13.3 (2017) and the Xiaomi Air 12, meet the new kid on Xiaomi’s block, the Mi Notebook Pro. Online Chinese retailer, Gearbest, sent us the sample and sells the Xiaomi Mi Notebook Pro for just over £868 ($1,140) at the time of writing. Note that, while this price includes delivery, it is exclusive of any taxes that may be levied by HMRC or the courier companies on behalf of the vendor. Want to buy tech from online Chinese retailers? Read this first. Ruthless postmodernism is how one might define the design of the Mi Notebook Pro – the chaps in charge at Xiaomi opted for a darker color scheme compared to its smaller sibling. ‘Deep gray’, as they call it, is an attractive alternative to the silver brushed metal designs that most thin-and-slim laptops sport. There’s no significant tapered profile here. Instead, you have an almost perfectly rectangular slab of metal alloy – with some curves here and there – that weighs just under 2kg, with its dimensions (360 x 244 x 15mm) making it hardly portable; that’s the price to pay for a larger display. In comparison, the Mi Notebook Air, which sports roughly the same configuration, is more than a third lighter and costs less. The biggest differences are the size and fewer ports. With the Notebook Pro, you get one HDMI port, two USB Type-A connectors and an audio jack on the left side, with two USB Type-C ports and an SD card reader located on the right. Note that one of the Type-C connectors is used as a power port. The power button is located at the top right-hand side of the device, not our favorite location. As is usually the case with Xiaomi laptops, there’s no logo on the top of the device. Flipping it over exposes a large flat surface with a Mi logo, a removable sticker, five rubber feet, a pair of speaker grills and a multitude of air vents. Open the laptop and you’ll see the 15.6-inch display, which is covered by a Corning Gorilla Glass sheet, an odd choice given that the display is not touch-capable. The long, single hinge, is reminiscent of Apple’s notebooks, and so is the layout of the keyboard. Remember, this is a 15.6-inch model so it has enough space for a numeric keypad. You won’t find one here, though, and instead Xiaomi engineers opted for full-size keys with a low activation force, short 1.5mm travel (to give better sense of confirmation), a 0.3mm thick hyperboloid keycap (rather than a flat one) and a noticeable absence of any double-function keys (at least on the main bank of keys). And yes, this is a backlit keyboard and unlike some competitors, it only offers an on-off option. The touchpad is large and houses a fingerprint reader. It doesn’t have physical right and left buttons which might put off some folks. The Xiaomi Mi Notebook Pro is one of the very few laptops to feature Dolby’s Atmos sound technology, which is used in conjunction with Harman Kardon Infinity speakers; there’s a pair of the latter on-board (2.5W models). It is also one of the first to offer an 8th-generation Intel Core CPU. 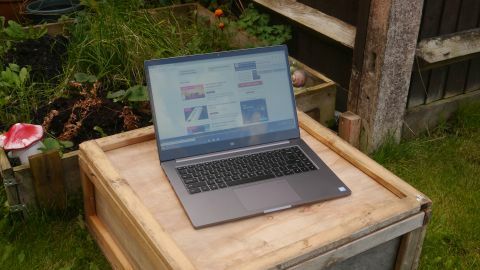 Our review sample came with the Core i5-8250U, which is far superior to previous Core i5 processors for one good reason: it is the first time that Intel has opted for a quad-core model for that range, and one that supports multi-threading. So it has four cores, eight threads, a base frequency of 1.6GHz and a Turbo frequency of 3.4GHz. Add in 6MB cache, support for DDR4-2400 and a new graphics subsystem (Intel UHD Graphics 620) and you have a compelling processor that should easily surpass even a Core i7-7600U CPU in multi-threaded tasks. The Nvidia GeForce MX150 discrete GPU which is equipped with 2GB GDDR5 memory is based on the Pascal architecture and should deliver up to around a third extra performance compared to the GeForce 940MX. The MX150 also supports Optimus technology which allows applications to switch seamlessly between integrated (UHD Graphics 620) and dedicated graphics to save battery life when the latter isn’t needed.